Imagine this with me . On March 5, 201 0 it was a friday I'd never forget , a white van pulls along side my house and out hopes a little person and my eyes light up ! But wait let's take it back a week before . I get a call from the director saying " I have a placement for you that needs to happen very quickly " keeping in mind I just had a child leave my house a month before so here I was waiting a year to get a child and they are coming back to back ! :). I go 50 miles to meet this child to make sure we are a match my agency didn't have much to tell me only his social worker and his name . I'm a African -American and I remember my director giving a name that seemed ethnic to me . Can you imagine my surprise to see a little Caucasian child sitting at the table ! (Lol) It didn't matter to me I was just a little shocked by the name . Well we proceed with the meet and greet it went great! The social worker and my self step to the side and began to talk. First thing she says to me is can you take him cause he needs to move next friday ! I'm saying WHOA so soon ! Then I said of course his room is all ready ! Now friday is here . He is all moved in and he looks so small and scared . He didn't say much at first I ride him around town to see the area then he began to talk and that's when I heard a little voice say "DAD". It melted my heart instantly and a knew then he was mines . Now don't think we didn't have any hadrships because we did ! Months go by and he is impoving everyone is happy for him , then his social worker comes to visit and tells him he won't be able to go home and she pulls me aside and tells me his mother has signed he rights away and at that moment I'm heartbroken for him . His social worker asks him about the type of family he wanted he said two parents and a brother . Now its time to find him a family . His social worker had ask me before she left "Would you consider adopting him ?". I replied "You didn't even have to ask". The seach is on. She finds the exact family he was looking for , I'm crushed I thought I had lost him I didn't want to influence is desicion so I just packed him a bag and sent him on . For three days I cried and prayed. My family and friends were upset for me . The social worker called 3 days later and said "He wants YOU and only you , he wanted to come back the first night but we wanted him to try it out " . Greatful and relieved was my heart. When he came home and jumped into my arms and said "Daddy I missed you so much" ! And I asked him one simple question "Can I be you father?" He told me and this is no lie "You already are Dad" . I told the social worker you can stop the search now we are a family . I didn't think they would even consider asking me because of our differences but my director had already told them I would be perfect for him all you have to do is ask him . After we cleared everything up it was time to get the ball rolling on the adoption Every one was excited ! 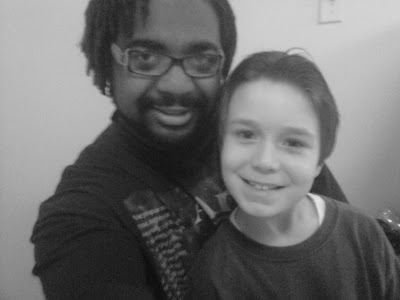 It only took 3 months complete everything on March 9, 2011 I adopted one of the most kind hearted grateful children I have ever met , and I'm proud to call him my son . Ok...this story got me. Pretty tough typing this through the tears right now!